Making this cake is dangerous. It is impossible to walk away without licking every batter-covered surface. You have been warned. If you’ve followed this blog for a while, you know I’m something of a compulsive recipe-clipper. This particular scissor-worthy recipe entered my baking rotation sometime in the 1980s, when I served on a social committee that was planning an English tea-themed event. I remember the recipe came from a magazine, but cannot recall whether it was Gourmet, Food & Wine, or Bon Appétit. If a recipe I’d clipped was a hit, I’d bestow it with my highest honor, typing or writing it out on an index card. In this case, however, I neglected to note the source. Too bad. But it’s funny; I can still see an image of The Donald and Ivana (for they were still married then) in a photograph accompanying the recipe. * (I tend to have a selectively eidetic memory.) The Trumps owned the Plaza Hotel at the time, and this cake was on the menu there. Not that I ever had a chance to enjoy it in those hallowed halls myself. But if the Midlife Second Wife couldn’t go to the Plaza, then the Plaza surely can go to the Midlife Second Wife. And it does, each time I bake this sumptuous cake. Don’t be alarmed; this really is how the cake is supposed to look after you remove it from the oven. The cake will rise slightly, then sink in the center. 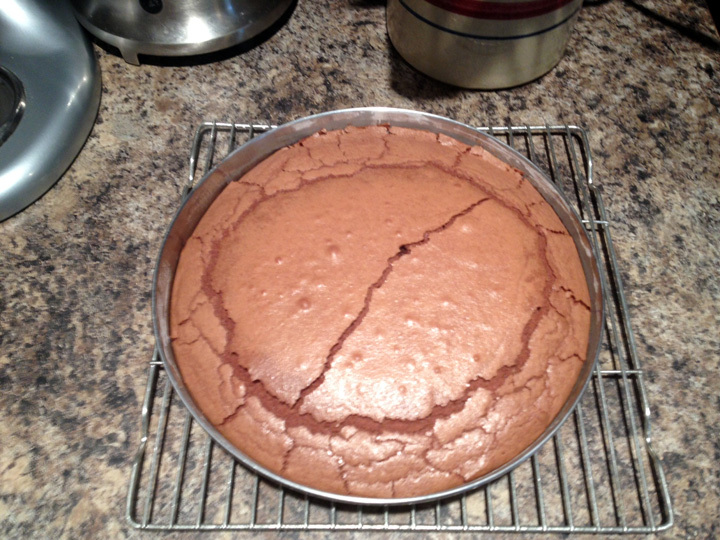 Cool cake in the pan, then invert onto a serving plate and peel off the parchment paper. Cake will be dense and moist. Chill for one hour and spread the top with fine quality raspberry or strawberry jam. This cake freezes beautifully, if carefully wrapped. 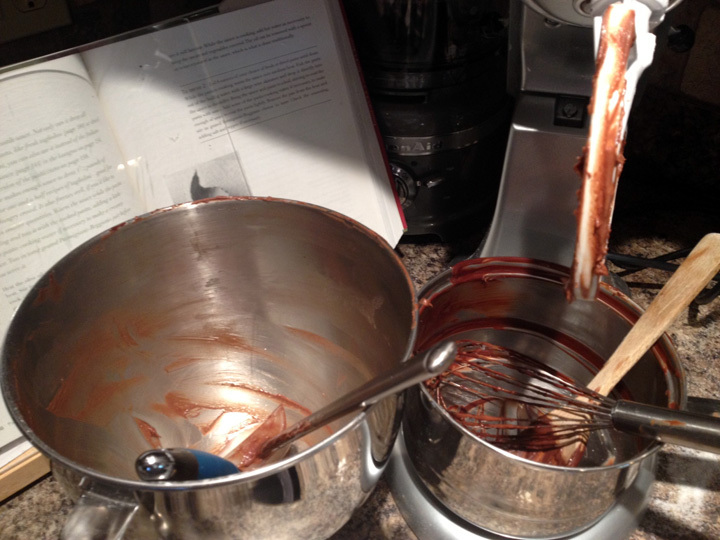 I should point out that I always make two cakes at a time, doubling the ingredients. This way, I always have a delicious dessert on hand for unexpected company, or the start of a stash for the holidays. 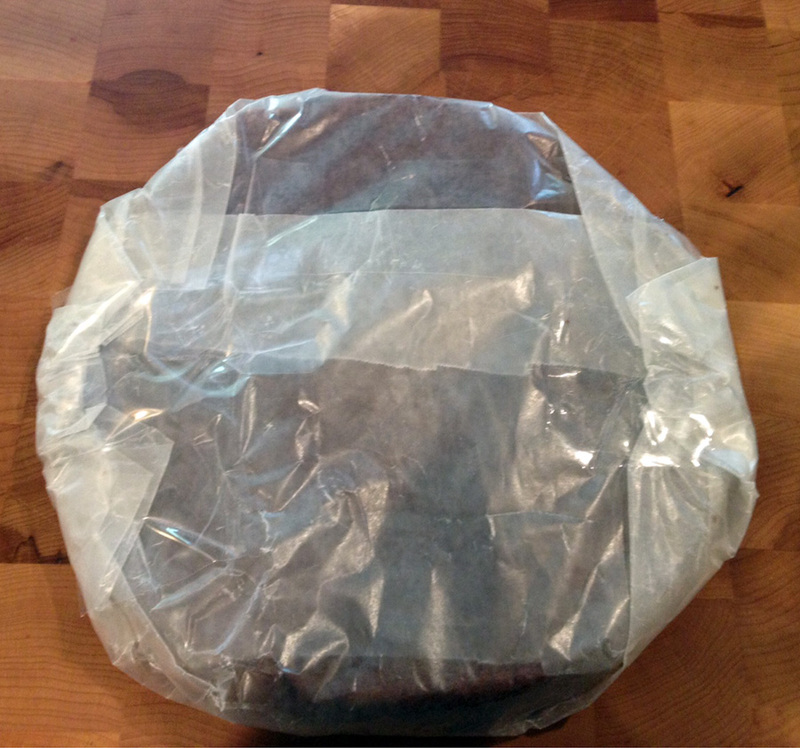 To freeze, I wrap the completely cooled cake in waxed paper, then I wrap it in foil, and then I place it, gently, in a plastic Ziploc bag. I know that you’re eager to see a picture of the finished cake, so here it is! 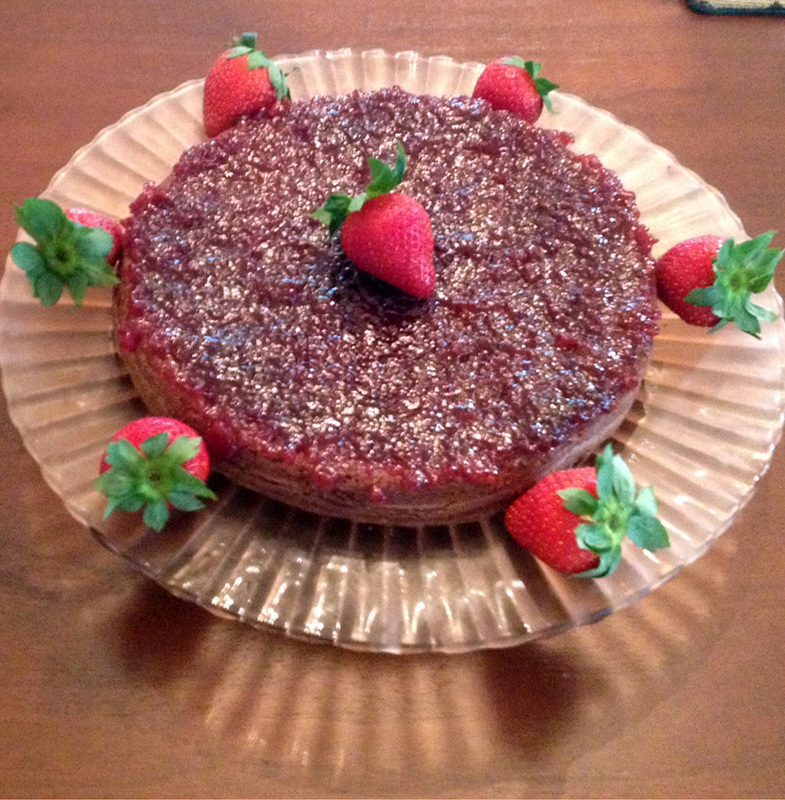 Looks simple but decadent – simply decadent! Do you frost this? Chocolate Icing? Yum. I have a holiday tea party for 12 every December – this looks like a good option for one of my desserts. Looking forward to seeing a photo of the finished cake. AND I like your idea of making two and freezing one! Thanks for your lovely note! The frosting for this could not be simpler: strawberry jam or raspberry jam. You choose. And I love making this cake for Christmas. I put a little (plastic) holly decoration in the center. Looks great on the table! Hope you like the cake…write back and let us all know how it worked for you! Would never have thought of jam – love the idea, especially chocolate with strawberry. Will definitely let you how it turns out – thanks! The dessert looks yummy and I love the fact it can be frozen for later. Yes, freezing is a huge help, especially when baking for the holidays. And “yummy” is a pretty good word for it! Thanks for your comment!